Sulpicio Lines currently holds the world record for the worst peacetime maritime disaster due to the sinking MV Doña Paz which killed approximately 4,375 people in the Philippines, dwarfing the death toll of the RMS Titanic of 1,517. The company also holds the record for the highest death toll of any shipping line in the world killing more than approximately 5,300. MV Doña Paz – is the worst ferry disaster and the worst peace-time maritime disaster in history. The Doña Paz was a passenger ferry that sank after colliding with the oil tanker Vector on December 20, 1987. The Doña Paz was en route from Catbalogan, on Samar Island, Philippines, to Manila when, while it was in the Tablas Strait, between the islands of Mindoro and Tablas, it collided with a small oil tanker, the Vector, which was carrying 8,800 barrels of petroleum products. The Vector’s cargo ignited and caused a fire that rapidly spread onto the Doña Paz, which sank within minutes. Two of the 13 crew members aboard the Vector survived but all 58 crew of the Doña Paz died. 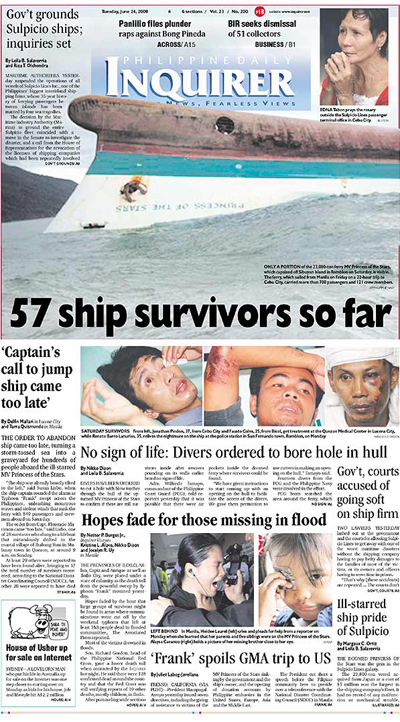 The official death toll on the ferry is 1,565 although some reports claim that the ferry was overcrowded and that the true death toll at least 4,341. The ships would put the death toll at 4,375 although admitting that only 1,568 were on the manifest (still more than the licensed maximum of 1,518). The 21 (or 24) survivors from the ferry had to swim, as there was no time to launch lifeboats. An inquiry later revealed that the crew of the Vector was under-qualified and that the boat’s license had expired. It is the worst ferry disaster and the worst peace-time maritime disaster in history. MV Dona Marilyn was a ferry owned by Sulpicio Lines, Inc., which sunk on October 24, 1988 while caught mid-voyage in a typhoon. It left 254 dead. The ferry was en route from Manila to Cebu City. This ferry is a sister ship of the ill-fated MV Dona Paz. On September 18, 1998, Sulpicio’s M/V Princess of the Orient, sailing from Manila to Cebu, sailed into a typhoon. She capsized at 12:55 p.m. near Fortune Island in Batangas. Of 388 passengers on board, around 150 perished. Passengers were floating at sea for more than 12 hours before rescuers were able to reach survivors. The MV Princess of the Stars, flagship of the Sulpicio Lines fleet, left the port of Manila on June 20, 2008 on its way to Cebu City. The number of passengers is variously reported between 700 and 800. 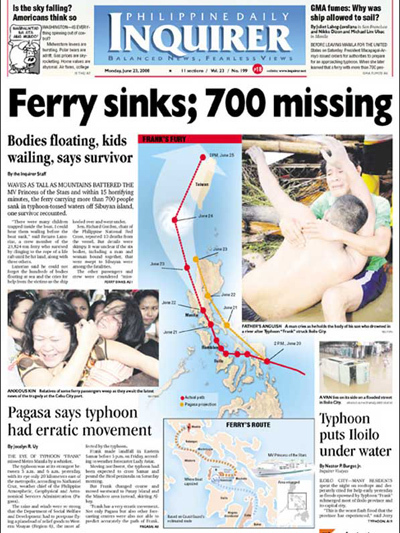 The ferry sent a distress signal at midday on June 21 when its engines stalled in rough seas near Sibuyan Island. San Fernando mayor Nanette Tansingco sent a speedboat and confirmed that the ferry had a hole in the hull, was partially submerged and that several bodies had been found nearby. As of June 23, four bodies were recovered by the Philippine Coast Guard and the Philippine Navy.According to the Coast Guard, the ferry’s manifest recorded 702 passengers including 50 children as well as 100 crew. The civil defense office said the ship carried 626 passengers and 121 crew members. Three Navy vessels were dispatched but one had to abort its mission due to “gigantic waves, pounding rain, and gusty winds,” said Lieutenant Colonel Edgard Arevalo, spokesman of the Philippine Navy. Tansingco confirmed that 4 aboard died and hundreds of passengers were still missing. Dozens of people trooped to the offices of owner Sulpicio Lines in Cebu and Manila North Harbor. The victims’ families accused Sulpicio Lines and the Philippine Coast Guard of allowing the ship to set sail despite the bad weather. They further blamed Sulpicio for not personally informing them about the tragedy, the details of the accident, and the condition of the ship plus its passengers. Sulpicio Lines’s counsel stated that “the ship never received advice from Coast Guard, while Metro Manila was still under public storm signal No. 1 when the ship left the port.” Furthermore, BBC quoted President Gloria Macapagal-Arroyo as saying, “Why did you allow it to sail and why was there no ample warning? I want answers. 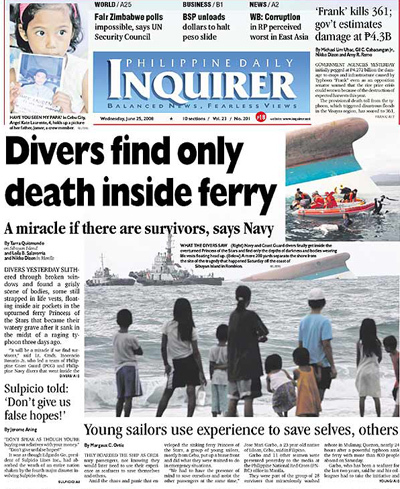 Sulpicio admitted that 860 were on board as the ferry capsized: “There were 751 manifested passengers and 111 crew members on board the capsized vessel.” The Maritime Industry Authority (Marina) suspended all sea travel operations of the Sulpicio. Sulpicio lines released the names of 32 survivors with the complete passenger manifest and crew list uploaded on their website. dont make those people who already suffered from the death of their loved ones, suffer from getting what’s due for them. Sulpicio lines is a very big company, more than 20 owners running the business. The person responsible for clearing the vessel is no other than MR JONATHAN GO, VP for Operations. the authorities should file charges against this person. 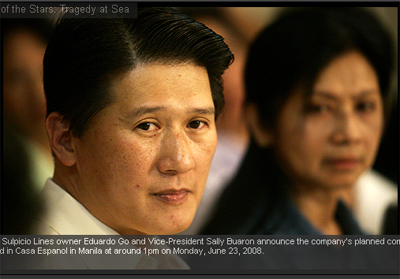 if only the courts could hold eduardo go and and the owners of sulpiciao lines in contempt and put in jail for at least as long as all victims inside the ship is retrieved then surely we will see quick action. unfortunately they have all the influence that ensure that does not happen. if there is justice in this world somebody out there will do permanent harm to these callous animals pretending to be humans. The seaferers were lack of experienced. The vessel must be ballasted properly before leaving the port….The free surface effect should be avoided…..